So you’re finally in the market for a new car and fantasized about how good you’ll look behind the steering wheel as you drive off the lot in those shiny new wheels. And you’ve probably rehearsed in your head exactly how your auto loan will go down when you march onto the sales floor, take charge and show them exactly how dealership financing is done. But soon it becomes painfully evident that financing a car isn’t the leisurely drive in the country you hoped it would be, filled with roadblocks, dead ends, wrong turns and a confusing one-way street of MSRPs, APRs and ADMs that no GPS can make heads or tails of. Combined with the unenviable task of negotiating with the manipulative methods employed by dealerships on naive buyers, it’s enough to make us want to get back into our clunky, battered beaters and chug and stall our way back home in search of some alternative to securing a new ride. To finance through a dealer or bank–that is the question. And it’s a query whose answer should become clearer with just a few simple considerations over the pros and cons. Whether you’re looking for new or used, contemporary or classic, there’s a car out there for everyone, and a myriad of affordable ways to pay for it. Why Is Dealership Financing So Expensive? Let’s face it, cars are a depreciating commodity and begin to lose their value the moment rubber hits road. That’s why finding a good deal on one is important since the majority of your new car’s life will be spent paying it off. So why does it feel like haggling with a dealer is an exercise in diminishing returns? Simply put, dealers need to make a profit, and that means a big push on the consumer to pay more money beyond the Manufacturer’s Standard Retail Price. Keep in mind some of the additional dealer markups–or ADMs–thrown at the consumer, and you can avoid paying more for your new car than it’s worth. They take many forms unbeknownst to the customer. Before you know it, that $19,000 economy family sedan is creeping into sports car territory with tacked-on extras like VIN etching, exterior and undercarriage rust proofing, Fort Knox-level security systems and some newfangled, special polyurethane-coated, upholstery protective sealant. There are also other, more straightforward expenses put forth by the dealer, like destination and delivery fees, and sales taxes, that can jack the price of a car sky high. It’s hard to ignore the “Zero down, 0% APR financing” stickers plastered across the windows and banners of your local dealership. But many hopeful car owners waltz into dealerships with the assumption that the advertised rate is exactly what they’ll get–only to receive a rude wake-up call. The Consumer Federation of America, for example, says that only 15 percent of car buyers qualify for this Holy Grail of car incentives; people with even the most respectable of credit scores may get saddled with a mediocre interest rate, or higher. Car buying guide CarClicks says that one reason for interest rate hikes is simple: The difference between how much dealers “sell” their cars for and the price at which they “buy” them from the bank, is marked up for their profit margin. A car dealer may also encourage prospective buyers to configure their payments with a higher amount of interest towards the start of the loan than there is towards the finish. Sign up for a 72- or 84-month finance plan, and that time may never come, especially if you’ve been convinced to buy more car than you can afford–think Lamborghini on a Kia budget. According to a 2011 study by the Center for Responsible Lending, motorists who financed their new cars through a dealership will end up paying over $25.8 billion in interest rate markups for the duration of their loan agreements. That’s an increase of $714 per consumer, or 2.47 percent. Is it any wonder why U.S. vehicle sales, according to the Center, declined over 20 percent between 2007 and 2009? Buying a car is like poker. Dealers have plenty of tricks up their sleeves to mark up their automobiles. They succeed because consumers enter showrooms unprepared and naive. That proud owner of a new personal luxury car won’t feel so great the following day when realizing that they didn’t sign a contract amidst all the excitement and flash. Others who don’t verify their own credit scores first may lock themselves into a bogus payment plan that could have been avoided beforehand. Fortunately, with all the aces in your corner, there are alternatives to circumnavigating the dealer and securing a sweet deal on the car that you want. You’ve built up a relationship with your local banker for other financing needs; why not pursue a bank car loan? Like a trusted family member or friend, your banker already knows you personally and can provide you personal service. They also have no stake in making a profit off the car like the dealer. Thus, a bank can give you more honest, objective feedback on your credit score, and if the dealer is overcharging you. As far as your loan, taking it to the bank can simplify the car buying process–financial institutions, rather than dealers, may offer other incentives like discounted life or disability insurance. Plus, bank car loans can be secured as basic interest loans, which means a steady interest rate over the life of the loan. Credit unions are another ancillary option to buying a vehicle, and like a bank, a sort of user-friendly go-between for you and the dealer. Because credit unions are not-for-profit, they also have no direct investment in nailing the sale like a dealer salesman would, which means they can help you find a better, more competitive interest rate. (Sixty months is one heck of a long time to pay off a 9% loan.) Plus, similar to banking institutions, credit unions are known for their ubiquity and accessibility. Don’t be ashamed to tell your dealer you want to seek an alternate financing approach. Joe Greenwald, a VP of marketing and communications for Credit Union Direct, says that signing on with a credit union is a simple as breaking the news to your car dealer. Greenwald suggests to research your local credit unions to find which one works best for your needs. Another, albeit riskier, option is to finance your new car with a home equity loan. There is a big perk: Secure that low interest rate on your loan and you could get a tax break from it. But beware! Home equity loans can endanger your domicile. Experts advise never to borrow more than the value of your home–in a financial crunch, you could stand to lose your car and your house at once. In a word, convenience. If you can stand to jump through their hoops and avoid sticking to the red tape, dealership financing is the most convenient and straightforward option, allowing you to view, test drive and buy a car in one simple location. Customers with solid credit histories and good negotiation skills will benefit the most from buying through this plan, and, with so many dealers in your area, the average car buyer is bound to find a good deal with some savvy searching. Rebates, cash-back offers and special trade-in deals are also great incentives for visiting a car dealer, and can greatly reduce the amount of your monthly car payment. Think with your head, not your heart, before whipping out your wallet at a car dealership. A new car is more than just a one-time purchase–it’s a long-term financial commitment that deserves great consideration before taking the plunge. Don’t settle for any less than the best deal you can acquire. Fortunately, between the variety of car dealers, banks, credit unions and other available options, you’ll soon be one with the highway, burning up rubber instead of cash. Learn if an eight-year car loan right for your auto purchase. 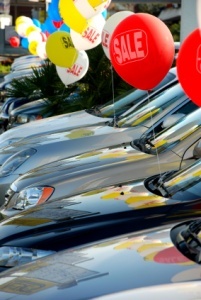 GOBankingRates > Loans > Auto > Taken For a Ride: Is Dealership Financing Ever Worth It?